The Bishop of Apartadó and the Catholic Church denounced the increase in killings of social leaders and political activists in the regions of Cordoba and Urabá. The Bishop Monseñor Hugo Alberto Torres Marin explain the gravity of the situation that they are facing in these regions of Colombia. This was the deadliest week so far in Colombia with 8 community leaders killed in one department (county) of Colombia – Uraba. The power vacuum left by the FARC with their movement on masse to the “Normalisation Zones” where they are demobilised according to the Catholic Church and NGOs working in the regions have been occupied by the neo-paramilitary groups also referred to as BACRIM (Criminal Gangs). These neo-paramilitary groups continue to be responsible for some of the worst atrocities perpetrated against the civilian population. In the first 23 days of January 2017, 11 human rights defenders were killed, the majority by these paramilitary groups. 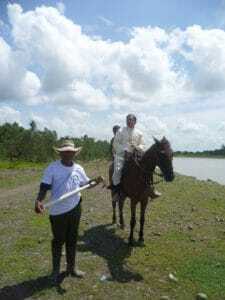 The Bishop Hugo Alberto Torres Marin, in a Public Statement published on 3 February 2017 expressed his pain at the abandonment by the state of the Urabá and Cordoba regions of Colombia. They are seeing scenes of forced displacement, drug trafficking, youth gangs violence increasing, and the destruction of the ecosystem with the increase of illegal mining. The Church is calling on the Colombian Government to ensure that these regions of the country are not abandoned to these illegal neo-paramilitary groups but that the State ensures that it exercises democratic governance of these regions, takes action against the neo-paramilitary groups prevents their violence, and protects the citizens of these regions. Of grave concern is that, our partner CIJP, report that the illegal armed neo-paramilitaries in this region have publicly declared they are going to initiate a project to “recover” the territory and that anyone opposing them will be killed. This “recovery” suggests forced displacement of the Afro-Colombian communities living on their collectively owned land in Curvaradó, Jiguamiandó and Bijao who have for many years been resisting displacement. According to PBI, who accompany human rights defenders in the region of Urabá, about 60 neo-paramilitary combatants with insignia of the Gaitanista Self-Defence Forces (AGC) Darien Chocó Front, armed with AK-47 assault rifles, entered the local communities of Bijao and set up camp. It is worrying that despite several meetings to monitor the precautionary measures issued by the Inter-American Commission of Human Rights (CIDH), where the risk faced to the population of the Humanitarian Zones has been mentioned repeatedly, there has been no effective response on behalf of the Colombian state. Even more concerning is what appears to be the lack of action against these neo-paramlitary groups by the State. They are referring to the paramilitary bosses that were jailed for Crimes against Humanity following the paramilitary demobilisation process in 2005. During this demobilisation process the mid-ranking officers did not take part in this demobilisation and continue to operate to-day; it is these groups that are referred to as the neo-paramilitaries. However links between many of these groups and the “paramilitary bosses” have continued.